Chilled wedge of iceberg, cherry tomatoes, shredded carrots, apple wood smoked bacon bits, and green onions. Served with your choice of homemade dressing. Homemade chicken salad and fresh iceberg served on a fresh croissant. 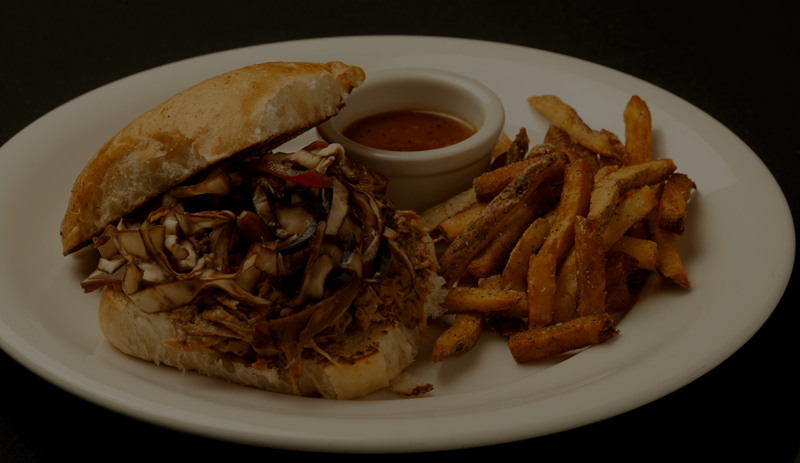 Slow roasted pork shoulder on a jalapeno cheddar bun served with homemade slaw and Leon’s BBQ. Thinly sliced Prime Rib dipped in homemade Au jus on French bread served with lettuce, tomato, and mayonnaise on the side. Deep fried gulf shrimp on a New Orleans style French bread served with lettuce, tomato, pickle, and homemade Remoulade. Hand-cut tenderloin cooked to desired temperature, served with mashed red potatoes and fresh haricot verts. Bowtie pasta tossed with a vegetable medley and Chef’s alfredo sauce. Gulf shrimp sautéed with Tasso, herbs and spices, served over our creamy stone-ground grits. Jumbo lump crabmeat blended with veggies and a cream reduction topped with a blend of cheeses and served with French bread.